Plasmids can carry one or more antibiotic resistance genes, which confer resistance to a specific antibiotic to the bacteria carrying them. The presence of an antibiotic resistance gene on a plasmid allows researchers to easily isolate bacteria containing that plasmid from bacteria that do not contain it by artificial selection (i.e. growing the bacteria in the presence of the antibiotic). Luria broth (LB) is a nutrient-rich media commonly used to culture bacteria in the lab. 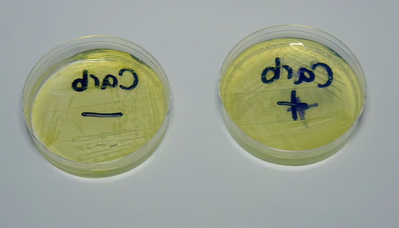 The addition of agar to LB results in the formation of a gel that bacteria can grow on, as they are unable to digest the agar but can gather nutrition from the LB within. The addition of an antibiotic to this gel allows for the selection of only those bacteria with resistance to that antibiotic - usually conferred by a plasmid carrying the antibiotic resistance gene. 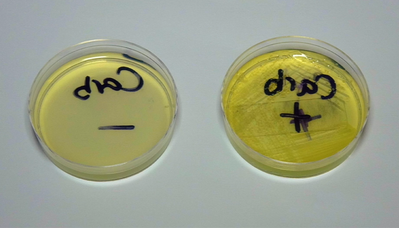 The following protocol will allow you to make your own LB/agar plates with your antibiotic of interest. Before you begin this protocol, watch the protocol video below to get a quick idea of how the whole process works. *Pro-Tip* If you will be screening a large number of colonies, we recommend using larger plates. Many labs use 100 mm x 15 mm plates which can hold 10 - 15 mL of agar. Antibiotic at 1000 x concentration disolved in the appropriate liquid solvent. See table to the right for appropriate antibiotic concentrations. Note: Unless otherwise indicated, the antibiotic powder can be dissolved in dH2O. Measure 37g of pre-mixed LB-agar powder per L of molten agar you’d like to make. The precise mass you measure out will be based on the number of plates you’d like to pour. For example: Because we’d like to make 20 plates, and our plates can hold a maximum of 10 mL, we’ll want 200 mL of media total. Importantly, we’ll actually make a bit more than 200 mL (~220 mL) just in case we spill anything or have small errors in measurement. You should also always make a bit more gel-ager mix than you think you’ll need. (37 g pre-mixed LB-agar powder/L) x (0.220 L) = 8.14 g pre-mixed LB-agar powder. Transfer the LB-agar powder you’ve measured out into an appropriately sized bottle for autoclaving. We make 400 mL of agar in 1 L bottles and 200 mL of agar in 500 mL bottles. The extra empty volume is necessary to prevent your molten agar from boiling over in the autoclave. Transfer the sterile water (in our case 220 mL) to the same bottle and swirl to form a medium/agar colloid. Cover the opening of the bottle with its cap or aluminum foil (but do not make an air-tight seal!) and tape the bottle with autoclave tape. The autoclave tape will darken during the autoclave process if your sample has spent at least 10 min at 121 ℃. Use lab tape to label the bottle with your initials, the date, and the bottle contents. This will clear up any confusion later if your forget your bottle in the autoclave. Place the gel mix in the autoclave and run on a setting that gets the sample to at least 121 ℃ under 20 psi for at least 30 min. The high pressure will prevent your gel mix from boiling over at high temperature. *Pro-Tip* Although our recommended temperature should kill most potential contaminants, certain types of spores will stubbornly survive even under the harsh conditions in the autoclave. Be sure to check the literature for an appropriate sterilization technique if you are working with any weird and wonderful organisms. Find an empty section of lab bench with a working flame. Spray down the bench with a 70% ethanol solution and wipe down with a paper towel. Count out the appropriate number of plates and stack them on your lab bench. Label the plates with the date and the medium they will contain including the identity of the antibiotic. 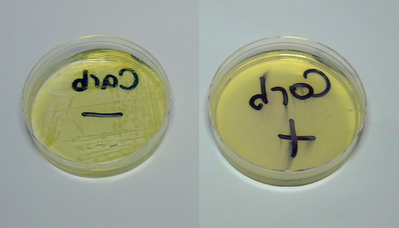 *Pro-Tip* We batch label our plates with colored marker - particular colors correspond to particular antibiotics. Position the flame just to the side of where you’ll be pouring your plates - be sure to leave room for your bottle of molten gel mix, a tube rack containing the appropriate antibiotics, and a section for active pouring. Prepare your antibiotics. Prior to adding your antibiotic to the molten gel mix, you should create a 1000x stock solution. For example: If you’ll be preparing plates with a final concentration of 100 ug/mL ampicillin, you should make a stock solution of 100,000 ug/mL (100 mg/mL). Simply measure out 100 mg of ampicillin powder, add it to 1 mL of water, dissolve by vortexing, and filter sterilize. Prepare a water bath at 60 ℃ with sufficient water to submerge ~75% of the bottle containing your molten gel mixture. *Pro-Tip* You will cool the molten agar in the water bath prior to adding the antibiotic. 60 ℃ is a good temperature because the molten agar will remain liquid at this temperature but most antibiotics will not break down at this temperature. Check with your antibiotic’s manufacturer to make sure this is true in your case. Retrieve your molten agar mix from the autoclave. *Pro-Tip* Once your autoclave cycle is complete, we recommend opening the door to the autoclave just a crack and leaving it open that way for ~10 min. This will allow any steam to escape from the autoclave and will cool your gel-mix slightly. Even so, you should always use thermally insulated gloves when removing anything from the autoclave. Partially submerge your molten gel-mix in the 60 ℃ water bath. *Pro-Tip* You should leave the molten gel-mix in the water bath for at least 5 min. Do not let any of the water bath water touch the neck or top of the bottle as this water is not likely to be sterile. Cooled agar should be warm to the touch; as a rule of thumb, if you cannot take the molten agar out of the water bath wearing only lab gloves, it’s not likely cool enough to add antibiotic to. To be certain your agar is at the right temperature, we recommend using a laser thermometer. Light the flame at the plate pouring station and dilute your antibiotic into your ~60 ℃ molten gel mix using sterile technique. Swirl the agar bottle to ensure even distribution of the antibiotic throughout the agar. Open one plate at a time next to the flame and begin pouring. Measure your desired amount of agar with a pipete for the first plate to get a good idea of what that volume looks like in your particular plate. For the remainder of the plates, pour directly from the bottle. *Pro-Tip* Be sure to swirl your plates after pouring to remove bubbles and ensure an even distrubtion of agar over the bottom of the plate. Cap each plate after pouring and stack as you pour. *Pro-Tip* If your agar partially solidifies in the bottle while you’re pouring, you should stop pouring and re-make the gel-mix. If you’re making plates without any antibiotic you can alternatively re-liquefy the agar by running it through the autoclave again or by microwaving (if you microwave, beware of over-boiling!). Leave your plates out on the bench to solidify. *Pro-Tip* It takes roughly 30 min for our plates to solidify at room temperature, however we leave them out at room temperature overnight to allow them to dry. After overnight drying, we place the plates in a plastic bag with an absorbent material to reduce condensation. The plates are then stored at 4 ℃ until use. On the first plate, streak out a strain that you know to be resistant to the antibiotic. On the second plate, streak out a strain that’s not resistant to the antibiotic. Incubate both plates overnight at the appropriate growth temperature and check for growth. See our sample data section below for positive and negative test results. In all cases below (-) indicates that the tested strain is not supposed to be resistant to the antibiotic, (+) indicates that the tested strain is supposed to be resistant to the antibiotic. If everything was prepared properly, you should see growth of only the resistant strain. If you get this final result, your plates are ready for use or storage at 4 ℃. You should not store your plates for longer than 1 month at any temperature and should always check for contamination prior to use. You forgot to add the antibiotic. You added the antibiotic at too low a concentration for selection. You used the wrong antibiotic. Your antibiotic is at too high a concentration. One or both of your strains are no longer viable. 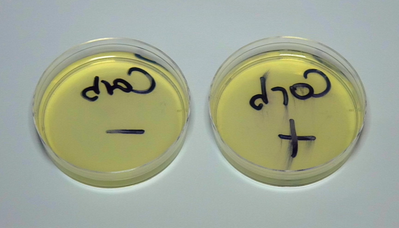 You can check for this possibility by streaking out both strains on plates without any antibiotic. If only the non-resistant strain grows, it’s likely that you’ve used the wrong antibiotic, or confused your strains.